Most of us look forward to the longer, warmer days of summer, but this time of year can pose unique challenges for many businesses — especially in the hospitality and entertainment industries. When your summer workforce includes teenagers, you need to be aware of certain issues that can arise with a younger staff — and take the proper legal precautions. If you employ minors (18 years of age or younger), you must follow specific rules regarding the hours and types of jobs they can work, based on Fair Labor Standards Act (FLSA) guidelines. The rules vary depending on the age of the employee and the particular job. In general, however, the FLSA sets 14 years as the minimum age to work, and limits the number of hours worked by minors under the age of 16. Although children aged 14 and 15 may work eight hours on a non-school day and 40 hours in a non-school week, they can only work three hours on a school day and 18 hours in a school week. The FLSA doesn’t restrict the number of hours a minor aged 16 or older may work. In addition to restricting work hours for 14- and 15-year olds, child labor laws limit the work teens may perform, with specific restrictions for grocery stores, restaurants and as lifeguards. Other job restrictions apply to all workers aged 14-18. Keep in mind, too, that although 17-year-olds may drive as part of their jobs, you must follow specific rules and can’t ask them to handle urgent, time-sensitive deliveries. Regarding compensation, you can pay a special minimum wage of $4.25 an hour to employees 19 and under for the first 90 consecutive days of employment. After that, if you intend to pay an employee less than the minimum wage (which may be higher in your state than the federal level), you need a special certificate from the Department of Labor. To protect your business, be sure to keep proper and complete records of the employee’s birth date, daily starting and quitting times, daily and weekly hours of work, and occupations worked. When your summer workforce includes teenagers, you need to be aware of certain issues that can arise with a younger staff — and take the proper legal precautions. Preventing sexual harassment is a priority in any workplace, at any time, but it can be especially problematic during the “easy, breezy” days of summer. This is a good time to review your company’s dress code policy and specify what’s acceptable. Don’t assume that employees will use their better judgment when it comes to certain clothes (and how much skin they expose). Are shorts, capris, tank tops, strappy summer dresses, sandals, flip-flops, hats and other warm-weather staples acceptable? And what if an employee shows up to work wearing something inappropriate? Will you send him or her home immediately, or issue a warning? Be aware, too, that teens may be particularly vulnerable to harassment. Because they are younger and less prepared, they may hesitate to stand up to harassing behavior. Or they may feel they don’t have the authorization to complain about a colleague, especially one in a more senior position. Further still, uninformed teen workers may be guilty of harassing another coworker, perhaps without even realizing the boundaries. Working teens need to know what constitutes harassment, as well as what resources are available to them if they are victimized. Harassment training shouldn’t take a summer vacation: It’s essential for reducing incidents of improper behavior among your year-round and seasonal employees. Though the beach, backyard or neighborhood barbecue may beckon during the sunny days of summer, the fact remains that you’re running a business and the work must get done. Don’t wait until you have an attendance problem before taking a stand. Your employee attendance policy should be in writing, included in your employee handbook and communicated to all employees so it can be enforced. 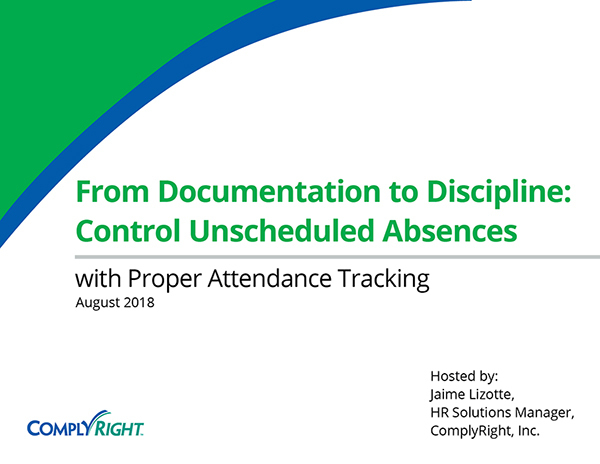 Clarify when chronic lateness and absenteeism are cause for discipline, and outline how many absences or tardies are acceptable. Also, be certain to enforce the policy consistently. You may be courting a discrimination lawsuit if you only discipline some employees for poor attendance, but ignore the time-management habits of others.